TORONTO, ON – At a trade symposium held earlier this month, Ontario’s government-run alcohol retail chain the LCBO announced plans to open a Craft Beer Destination shop at its flagship Summerhill location in Toronto, as well as smaller craft beer specialty sections in 25 other stores across the province. According to the presentation, the sections will feature craft beer from all regions – Ontario, the rest of Canada, the U.S., and International – although Ontario brands will be featured more prominently. The Summerhill shop will also feature a growler station with three lines filling growlers to order, and additional brands available in pre-filled growlers. Specially trained Beer Ambassadors will offer advice and guidance to shoppers, and unique products and special events will also be featured. The Craft Beer Destination shop at Summerhill will be opening in August 2015. Timelines for the specialty sections at other locations have yet to be announced. For more details, see the full presentation (6 MB PDF file) from the LCBO Trade website. This is great news but unless I read the article wrong, the title is very misleading. 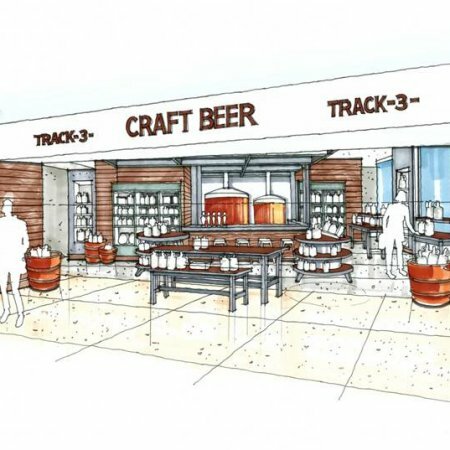 The headline suggests that new stores will be opening that sell nothing but craft beer. Nowhere in the article is there evidence of this. Rather, existing craft beer sections in LCBOs will be expanded is what I get from the article. Still good news, but I was a bit let down after reading the headline. John – Thanks for the comment, and you’re right, the title isn’t really worded correctly. I’ll change it. I’m guessing the big breweries get to decide what “Craft” means? Given that that LCBO has a good relationship with the Ontario Craft Brewers, and have never included any macrobrewery pseudo-craft brands in any of its seasonal craft beer promotions, I’d say that the chances of the big breweries having any input into this are slim to none. Good news even though they are 20 years behind the rest of the world. Too bad I couldn’t wait for Ontario to catch up so decided to make my own Craft Beer. I guess I should say ” Thanks Ontario “. Thanks Ontario, and cheers to homebrewed Craft beer. And I am sure the LCBO will reduce it’s inflated profits to let the small breweries be more competitive and increase their customers. Probably not. Ok- so I’ve read this type of comment a couple of times now and I’m just going to call a spade a spade here. Perhaps you don’t realize that there are more important issues at stake than how much it costs you to buy BEER. If your view of the big picture doesn’t extend beyond your own wallet then its not a surprise that you resent the LCBO- and it’s “inflated profits” as you call them. Yours is a simple minded, ignorant, and deeply selfish attitude. The idea that one’s personal end cost is so much more important- more valuable than a well funded, robust, and healthy society in general is such an egotistical one. The current system (with the exception of the Beer Store, Vincor, and Peller- you know- the PRIVATE retailers…), provides funding for social programs and services that are not reserved solely to the unemployed or the less fortunate. You use them. I use them. You know what they are. How do you expect to pay for those things? Would you like to fork over more income tax? Would you prefer that your property taxes increase? Perhaps kicking the poor out into the streets to fend for themselves would be a solution that falls more neatly into your moral viewpoint? Name something- lets see if it flies. But let’s be honest… To pretend that the billions raised annually through profits on LCBO sales would be replaced in taxes (that the public would accept without a fight) is a fantasy. It’s fiction. It’s a lie that people who don’t understand the system believe and one that is reinforced by private businesses looking for bigger gains and greater access to the consumer. And just to clarify- I don’t have a problem with businesses trying to reach their customers and make money- that’s what businesses do. But this is the system we have and it works really well when it come to funding the sort of lifestyle the majority of us are accustomed to. A compromise like the one in this article is best for everyone. I’d like to see more of this. I think you missed the probable point of the original comment here. Many provinces will lower taxes for craft brewers to help grow the industry which in turn brings longer term gain for the government in the area of taxes. Considering the increase in government spending in Ontario over the last decade or so, I think they could stand to lose at least $1.7b (the amount of profit the LCBO remits to the government) a year. And that’s assuming that none of that profit would be recovered from private retailers through good ol’ liquor taxes like in practically every other jurisdiction in the western world, something your pile of false dichotomies completely discounts. Although Brendan is a little harsh with his words, he does have some good points. The system works well. Is it perfect? Does it favour beer drinkers? No not really. It keeps consumption lower through higher taxes which in turn keep things going. I’d probably drink more if beer was cheaper and enjoy it too, but there are benefits to this system. Well said, Brendan….Thank you for seeing the LCBO for what it truly is….one of the LARGEST AND MOST PROFITABLE supporters of the Ontario economy! We are very lucky up here in Kincardine on Lake Huron. Our LCBO manager and staff are very accommodating in bringing in local craft beer on request. Craft beer is, and has been very important even throughout history, to the well being of people. People forget that beer was often required, as was wine to a lesser extent, as a necessary way to supply safe water to people. I really enjoyed the comments on price. Price cannot be the only consideration. It is important, very important, but not everything. Quality has to be a balanced approach, trying to meet the needs of a deiscriminating consumer, with the ability to experiment, to produce differences in the product. To do that, Brewers need to be able to turn back profit into their business, not make gains for shareholders. I am very disappointed in the Brewers Retail organization that only recently, when people got upset, have decided to allow entry into their distribution network, but still charge fees that cause difficulty in being competitive. Also, we have to consider, that LCBO employees are unionized, are paid a reasonable wage and have a pension. This keeps good jobs locally. By doing this through the LCBO, at least we are making progress. Perhaps farmers markets would be a good next step. I do not, or have any affiliation with the LCBO, craft brewers or the Brewers Retail. Good article. Beer ambassadors sounds like the greatest idea in Ontario since a branch broke of a maple tree and leaked syrup! As a new Canadian I once went to the Beer store and asked what was better, Bud Light or Coors light? the response “We can’t offer you an opinion on our selection of beer”. Just as well I like the flavoured variety and I can’t wait for there to be more of it!